It randomly occurred to me one day that the inside of those bars would also work as a cupcake filling, so I gave it a try the very next chance I got. My instincts were good--the consistency was perfect for scooping into a fluffy and soft chocolate cupcake. A bite into these gems includes tender cake combined with a cool, creamy, coconutty filling and smooth, rich buttercream frosting. The kicker is some crunchy toasted coconut on top. SO perfect. I'm sure almonds could be incorporated in some way (like, say, with some almond extract in the frosting and toasted nuts on top) if Almond Joys are more your speed. Either way, this is a killer combination and definitely worth a trip all the way, way back to 2011. Make the cupcakes as directed and let them cool completely. Meanwhile, make the coconut filling by stirring together sweetened condensed milk and coconut in a large bowl, mixing well. To fill the cupcakes, carve out a cone-shaped hole and spoon the filling inside. Apply frosting generously to the cupcakes and, after giving the components a few minutes to get to know each other, sprinkle with toasted coconut and devour. Irresistible! I love that filling. We have Bounty bars, which work on a similar coconut & chocolate theme, and I love them, so pretty sure I would love these too! mmm..So decadent! I love that coconut filling. OMG! Coconut and condensed milk? YES, YES and YES...looks awesome Grace! I agree totally. I need some summer decadence... Tks for the review as I missed the first one!! Nothing better than constant improvements. There is always a way, or in this case a better recipe! 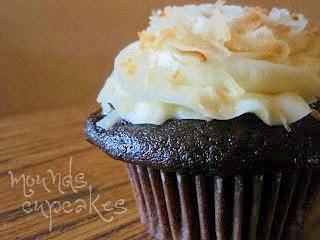 You must know that I'm crazy obsessed with chocolate and coconut...a perfect cupcake pair. Oh my! It's like a Bounty cupcake! I would quite enjoy the almond version too I think. Did you put the cupcake cone back in place? That would be great, too. I love this whole idea, because who doesn't like a good filled cupcake? Mounds and Almond Joy are my absolute favorite candies! You know I would LOVE these cupcakes! Bookmarked. I'll be making these beauties for the next birthday celebration we have. YUM! You know my love for coconut is abundant and versatile. I LOVE frosting that has toasted coconut. Oh yes! These are divine. Love these cupcakes. What a fabulous idea! These cupcakes sound amazing. That filling must be so outrageously decadent, that I cannot resist! Oh, yum! 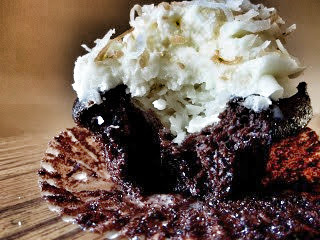 I love Mounds bars-what a great way to make those flavors into a cupcake.